The growth of nonstandard work has emerged as a global challenge that has a wide range of consequences. People differ in their vulnerability to nonstandard work, and women workers are more likely than their male counterparts to be employed in precarious forms of work. Therefore, it is increasingly important to understand the effects of unstable and unpredictable work on gender equality in the labor markets. The purpose of the workshop is twofold: to advance our understanding of how female nonstandard workers are utilized in different industrial relations systems and in different sectors; and to bring this comparative experience to bear on contemporary debates on new paradigm of social rights at work and to formulate policy initiatives for gender equal social protection. The workshop involves the collaborative efforts of prominent specialists in national industrial relations and of labor economists together, along with input from practitioners in the countries studied. The major sites of our research include Japan, Korea, and Germany. 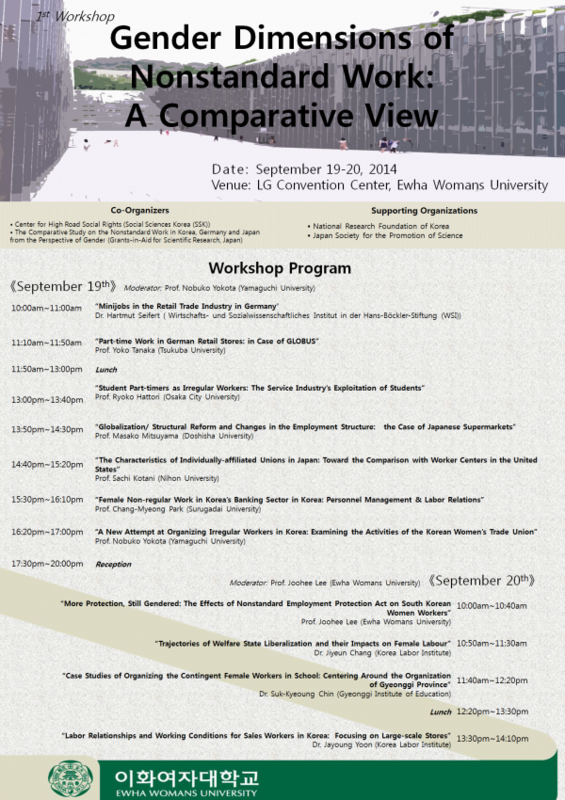 The workshop is co-organized by the Center for High Road Social Rights at Ewha Womans University in Korea (Director: Prof. Joohee Lee) and “The Comparative Study on the Nonstandard Work in Korea, Germany and Japan from the Perspective of Gender, Grants-in-Aid for Scientific Research, Japan (Project Manager: Prof. Nobuko Yokota). Japan Society for the Promotion of Science and National Research Foundation of Korea are two supporting organizations.